Location: Tilden Regional Park, Lake Anza parking lot (37.896618,-122.252316) (map) No parking fee, Please carpool if possible. Deadline: Friday, September 16 at 3 p.m. Cost: $7 per participant (shadowing adults do not need to pay). Bring: A compass, a watch, a pen or pencil. Lunch and water. Sunscreen or rain gear. The Bay Area Orienteering Club is pleased to announce the 24th Annual Bay Area Scout Orienteering Championship, a cross country map and compass adventure designed to test the map reading ability, compass skills and woodsman savvy of any scout regardless of experience. Cub Scouts of all ages are welcome. No prior experience needed. Instruction will be offered prior to the event so that all Scouts, regardless of prior experience, will be able to take part in the actual competition. There will be courses of four distinct levels of difficulty, so no scout should encounter a challenge beyond his capabilities. 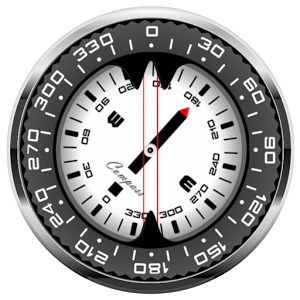 There will not be extra compasses to borrow at the event. Please get a basic orienteering compass and avoid these: iPhone, wristwatch, engineering, surveying, Happy Meal, tritium. - Most scouts will run in pairs with an adult trailing behind (Course 1). Those who are experienced and confident can choose Course 2 and run in pairs without an trailing adult. - Instruction will begin at 9:00 AM. The pre-assigned start time of each individual team will be determined by the entry date of our pack. In general, start times will begin at soon after 10:00 AM and go until about noon. - Every participating scout will earn a patch. - We need to pre-register with names and how teams will be paired up. Deadline: Friday, October 10 at 8 p.m.
Checks made to Pack 1776 due to Teresa or William Noble by Saturday, October 11 at 8 p.m.
Award: BAOC Orienteering patch, a progressive course patch, and more. The Bay Area Orienteering Club is pleased to announce the 22nd Annual Bay Area Scout Orienteering Championship, a cross country map and compass adventure designed to test the map reading ability, compass skills and woodsman savvy of any scout regardless of experience. Cub Scouts of all ages are welcome. No prior experience needed. Instruction will be offered prior to the event so that all Scouts, regardless of prior experience, will be able to take part in the actual competition. There will be courses of four distinct levels of difficulty, so that no Scout should encounter a challenge beyond his capabilities. Directions: Take route 24 West from 680 or East from 80. Exit at Orinda heading North on Camino Pablo. After about 2 miles, turn right on Bear Creek Road. After about 3.5 miles, the park entrance will be on your right (don’t be fooled by the parking area on the left – that’s not it), and is well sign-posted. Parking fee of $5. Please carpool if possible. 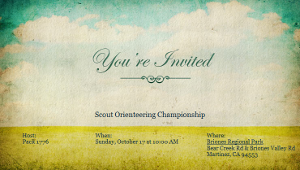 The Bay Area Orienteering Club is hosting its annual Scout Orienteering Championship, a map and compass adventure designed to test every scouts map reading ability and compass skills regardless of experience. The assembly area will be at the Lake Anza parking lot (37.896618,-122.252316) in Tilden Regional Park. Cost: $6.50 per scout (adults have to pay $6.50 only if they want a map). If paying by check, make the check out to BAOC. Deadline: This Wednesday, October 10th!! The Bay Area Orienteering Club is pleased to announce the Twentieth Annual Bay Area Scout Orienteering Championship, a cross country map and compass adventure designed to test the map reading ability, compass skills and woodsman savvy regardless of experience. Note that this year's event is not being held at Briones Regional Park! The assembly area will be at the Lake Anza parking lot (37.896618,-122.252316) in Tilden Regional Park. There's a map here that shows the location of the event. Cub Scouts of all ages are welcome. No prior experience needed. Instruction will be offered prior to the event so that all Scouts, regardless of prior experience, will be able to take part in the actual competition. There will be courses of four distinct levels of difficulty, so that no Scout should encounter a challenge beyond his capabilities. Be prepared and head over to BAOC's website for sample maps and instructions. - Scout need to run in pairs with an adult trailing behind. - First team of all the scouts attending will run at 10 am. Start times are spaced 2 minutes apart and by course. Start times are set by event organizer. Sign up by Wednesday and contact event coordinator Susan Kim if you have any questions. Reminder: Today (9/30) is the last day to sign up for Scout-O. To sign up, email Susan Kim your scout's name, den, rank, and preferred partner if any. Deadline: This Friday, September 30th!! The Bay Area Orienteering Club is pleased to offer the nineteenth annual Scout-O, a cross country map and compass adventure designed to test the map reading ability, compass skills and woodsman savvy regardless of experience. Sign up by this Friday and contact event coordinator Susan Kim if you have any questions. This past Sunday, our Pack 1776 Scouts did a fabulous job in their first orienteering event. They should all be proud of themselves for competing through the rain, past swings and goats, up and down hills so slippery they had to use a rope! Each of the above scouts received two patches and a blue scout "Do Your Best" wrist band. Pictures have been uploaded to the Pack photo site. If any student (elementary or middle school) is interested, there will be a free "Short Orientation To Our Interscholastic League" in San Leandro this Saturday. The volunteer in charge of the Junior League is Jan Hann and he is very thorough when teaching kids about orienteering. If you hear of anyone who would like to continue to race in the future, please let me know. There are upcoming events in SF, Woodside, Rancho Cordova, and Los Gatos. We have our orienteering event coming up this Sunday. I have attached lots of info, as well as a park map and sample orienteering map. Though the map on Sunday should be of higher detail. Please read the info document or pass it on to the parent who will be planning to come on Sunday. There are two ways to get to the Bear Creek Staging Area where we'll meet, one a bit longer but easier. The other is shorter but curvier with a narrow road. I will leave it up to you to decide the best way to get there. Since the weather will be warm, please be sure to bring a hat, water and snacks. Your scout will be hungry after the race. It would be nice if your scout could wear his burgundy Pack 1776 shirt. I won't know our actual start time until later. I'll let you know. Please email me if you have any questions. Please don't forget $5 per car for parking, $5 per scout, and $5 per parent or pair (mom & dad) of parents. The Bay Area Orienteering Club is pleased to offer the eighteenth annual Scout-O, a cross country map and compass adventure designed to test the map reading ability, compass skills and woodsman savvy regardless of experience. Cub Scouts of all ages are welcome. No prior experience needed. Instruction will be offered prior to the event so that all Scouts, regardless of prior experience, will be able to take part in the actual competition. There will be courses of four distinct levels of difficulty, so that no Scout should encounter a challenge beyond his capabilities. 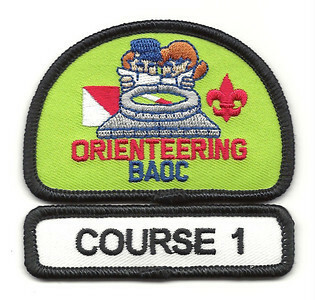 Be prepared and head over to BAOC's website for printable maps and instructions. - Scouts will run the course in teams of two, shadowed by an adult, $5 each. - There is a slightly different additional event at 1:30 that is optional. Scouts do not have to stay for that but they can. An evite will be coming to you. Sign up by October 7th and contact event coordinator Susan Kim if you have any questions.